Because you are a member of Delaware Electric Cooperative, a Touchstone Energy Cooperative, you receive discounts on products and services from participating local and national businesses and over 48,000 pharmacies. This is just one more way you benefit from being a cooperative member. There is no charge to you for this program. Dental, vision, hearing and chiropractic discounts are also now available. 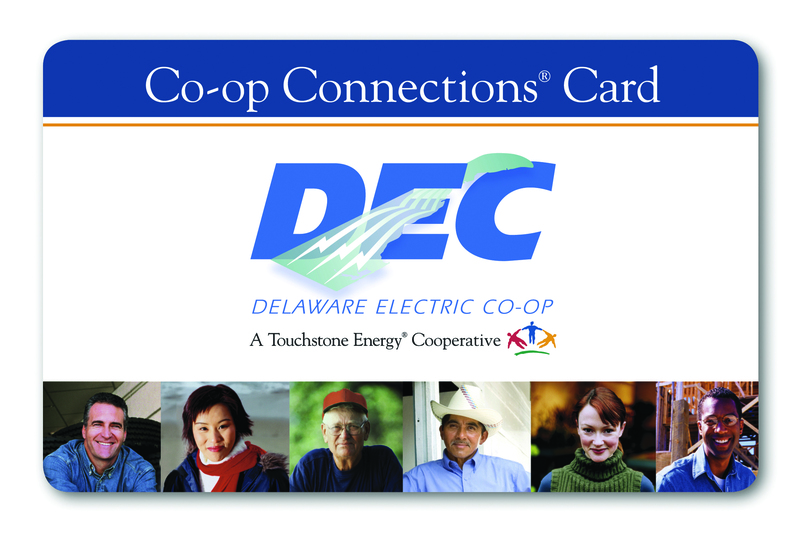 Since 2007, Delaware Electric Cooperative members have received discounts on prescriptions by showing their new Co-op Connections Card at over 48,000 participating pharmacies. Use the links below to find a pharmacy near you, or call 1-800-800-7616 to speak to someone directly. The list of discounts for local merchants and national chains is always growing! The discounts save you 10% to 60% on prescriptions at over 48,000 pharmacies nationwide, including CVS, Walgreens, Wal-Mart, Target and more. Your pharmacy discounts are provided as part of your Co-op Connections program at no cost. Yes, just present your card and prescription at a participating retail pharmacy to receive a discount at the time of purchase. I've lost my card. How can I get a replacement? Please stop by the Delaware Electric Cooperative office or call 302-349-3118 or email [email protected] for a replacement card. Your card cannot be used with insurance. However, use your card to purchase prescriptions not covered by your insurance plans at a discounted rate. The Co-op Connections card is accepted at over 48,000 retail pharmacies nationwide, including CVS, Walgreens, Wal-Mart, Target and more. You can find participating pharmacy locations by calling 1-800-800-7616. Yes, if you know the name, strength and quantity of the medication, you can find the discounted price of the medication here. Drug prices are different from pharmacy to pharmacy. Even chains have different prices in their stores depending on the population they serve. Additionally, manufacturers’ drug prices change periodically. To ensure members always save money on their prescription drugs, a unique mail order program was created to complement the network pharmacy benefit. Since most maintenance (long term) medications are purchased in 90 day supplies, members maximize savings and have the convenience of home delivery (at no additional charge) by ordering through the mail order option. Please call 1-800-800-7616 for more information about this program. How can businesses sign up? This program gives businesses the opportunity to offer our Cooperative members an incentive or discount and in exchange for your participation, we promote your business and discount offers to our members at no cost to you. The program is designed to benefit your business and our members. We advertise your business on our website www.delaware.coop, monthly newsletters, brochures, and at our member meetings in exchange for your offer of a discount to our members that show you their Coop Connections Card. Your business will gain free advertising and Delaware Electric will build a stronger sense of community with its members. Please fill out the following forms and mail them to Delaware Electric Cooperative.